Wedding season is in full swing and your local Safeway floral department has an amazing new Safeway Flowers Wedding Collection designed by Debi Lily with everything one would need to make their special day amazing including bridal bouquets, attendant bouquets, table arrangements and boutonnieres. 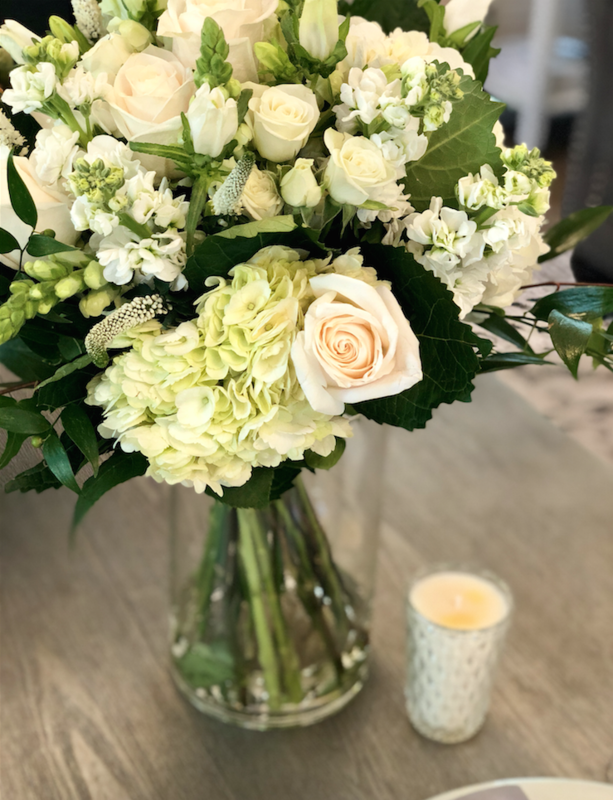 Debi Lily is a talented floral designer and event planner and she has her own line of floral designs as well as gifts and decor available at Safeway, including the new wedding floral line. I received two bouquets and had the pleasure of photographing these gorgeous new Safeway flower wedding arrangements last week at the Barn at Raccoon Creek and these are absolutely stunning arrangements. If you or someone you know is getting married, or if you are throwing an engagement party, bridal shower, rehearsal dinner or any gathering for the wedding party, be sure to head into your local Safeway to check out the complete assortment available. What can you expect working with a Safeway floral designer? The floral designer will show you the selections available in the new wedding collection and you can talk through options based on your colors, theme, venue, and stylistic vision for the big day. 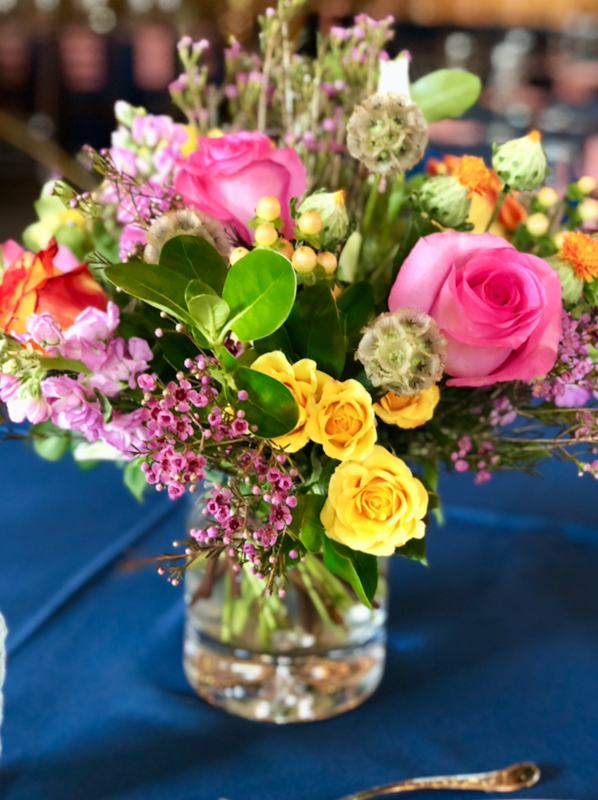 You can select directly from the pre-arranged options, or if you prefer, you can customize your arrangement with a large variety of flowers available through the Safeway floral department. Because of the volume of flowers sold through Safeway stores, you can save some money by ordering your wedding flowers at your local store. 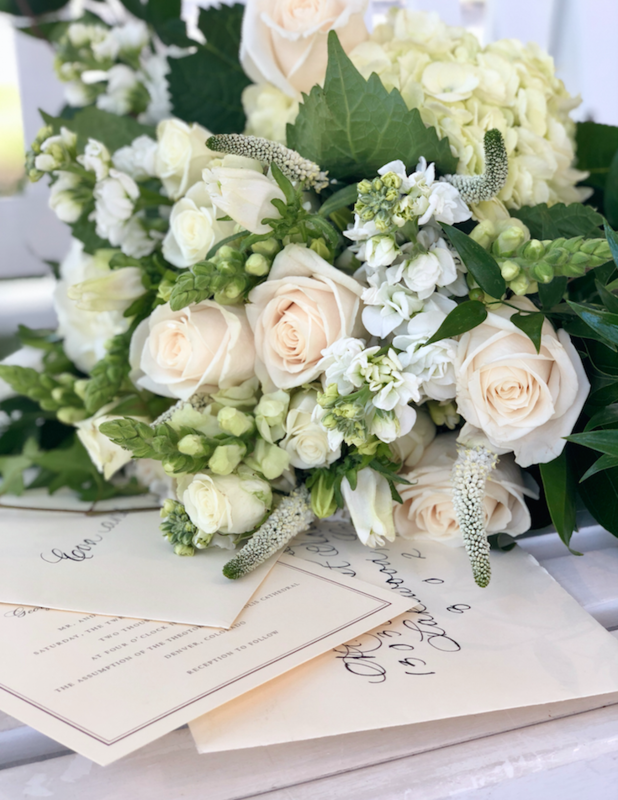 The pre-arranged bridal bouquets, attendant bouquets, boutonnieres and vase arrangements are available in four gorgeous options, with beautiful high-end flowers including the White Collection, the Foliage Collection, the Lavender Collection and the Wildflower Collection. I photographed the White Collection bridal bouquet and the Wildflower Collection vase arrangement to highlight two possible options available in the new wedding line. 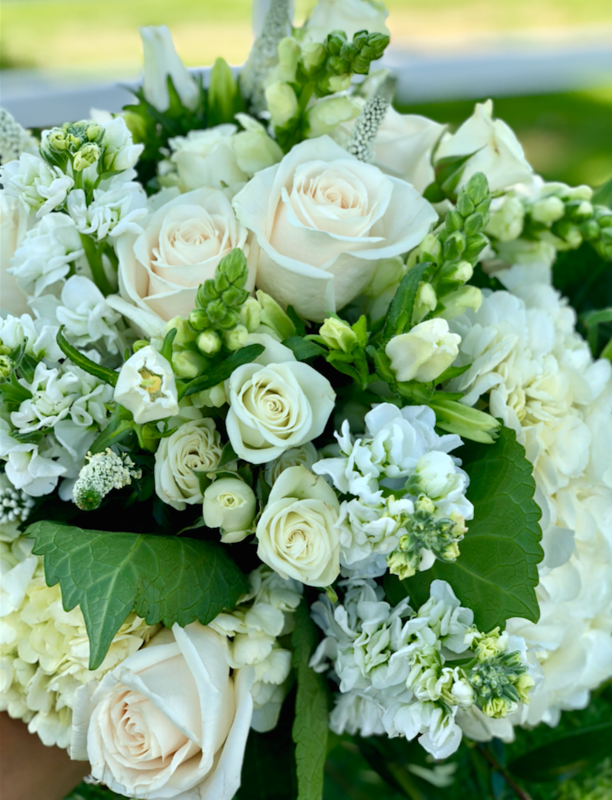 The White Collection Bridal Bouquet, featured here has gorgeous white roses, hydrangeas, white stocks, Campanula and Italian Ruscus and Trailing Ivy with a white satin ribbon holding the bouquet together. The White Collection Bridal Bouquet is $89.99. The attendant bouquets, which are very similar, just slightly smaller than the bridal bouquets start at $35.99 and the vase arrangements with a heavy round glass vase start at $55.99. 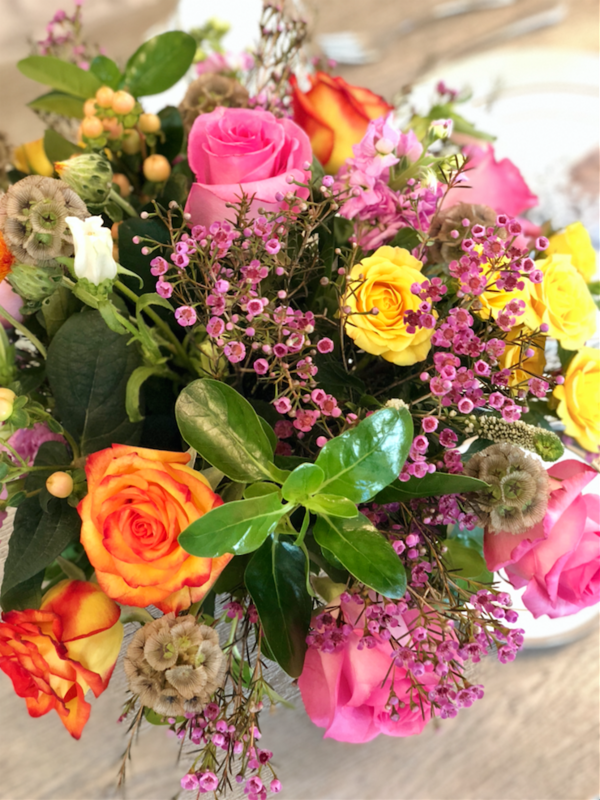 The Wildflower Collection arrangement has gorgeous pink, yellow and orange roses, waxflower and scabiosa pods, pink stock, orange berries, and white bell shaped flowers. The Wildflower wedding bouquets start at $27.99, the attendant bouquet is $23.99 and the vase arrangement is $55.99. Perfect for a summer, fall or spring wedding. The best part of the new Safeway wedding collection is that the wedding will be perfectly color coordinated if you so choose, from the attendant bouquets and boutonnieres to the centerpieces at the reception. This is one less thing you have to think about. If you want to put your own arrangements or centerpieces together, Safeway offers the wedding collection flowers in the pre-arranged designs available in the floral department. To save on vase cost, you could purchase your own vases on sale elsewhere (I like Hobby Lobby’s vase selection) and clip the loose stem flowers and arrange in the vases on your own. This is a sponsored post on behalf of Safeway to announce their new Safeway Flowers Wedding Collection designed by Debi Lily. Visit your local Safeway floral department to see all of the gorgeous color and flower options available in the new Wedding Collection. We appreciate you supporting the brands that make this site possible. Great! Be sure to ask for the wedding brochure at your local Safeway.